Leading Manufacturer of botanical extract as bio insecticides from Nashik. 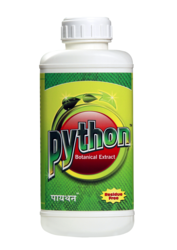 python is the best result oriented eco friendly residue free naturalbioinsecticide&miticide. It is derived from various plants having insecticidal properties; being natural, it is safe for human & livestock. python protects plant by creating the deterring effects on foliar parts due to its pungent odour, bitter taste, so it becomes non- consumable to insects & helps to kill pests by starving them. python is very good remedy to control, Red Mites, Scarlet, Yellow Mites, Purple Mites, sucking pests likeThrips etc. Foliar Spray :- 200 ml / 100 Liter of water with spray adjuvant Orsil 20ml. Compatibility :-python is compatible with almost all commonly used pesticides and bio pesticides and bio fertilizers. Packing :-250 ml, 500ml, 1Ltr. Looking for BIO PESTICIDES ?